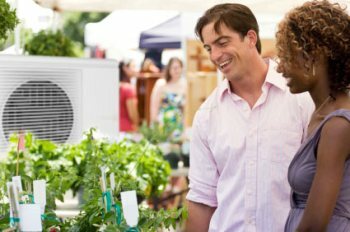 Know where you plan to use a swamp cooler and how you plan to install it before you make your purchase. With a general idea of its set up, you'll know whether to get a swamp cooler rated for a dry, damp or wet location. Will it be set up inside a partially enclosed area, such as a tent or shed? Will it be set up on a hard, dry surface, a table or the bare earth? Will it be installed permanently or moved indoors out of the damp night air when not in use? Electrical appliances are rated for one of three kinds of environments and answering these kinds of questions helps you see which kind of environment you have. DRY — for indoor use and dry locations ONLY. Protect it from any dampness or wetness in garages, warehouses, or sheds. Don't expose it to the damp night air. Never use a DRY rated cooler in damp or wet locations. It simply doesn't have the right safety features. DAMP — safe for protected outdoor use, for example, open walls with a solid ceiling, in a greenhouse or tent; not good for direct contact with water such as rain or puddles, but outdoor humidity is fine. Can be set on bare earth as long as it doesn't rest in any puddles. Damp rated coolers don't have the safety features to be used safely in wet locations, but they can also be used indoors and in dry outdoor locations. WET — can get totally wet — rained on or sitting in a puddle is fine; can be cleaned by hosing off. SAFE to use indoors or outdoors. Can be safely used in all 3 kinds of locations. Look for the testing agency's seal on the box of a new swamp cooler or stamped or labeled somewhere on the cooler, itself. If you are shopping in a catalog or on a website, look for a statement like, "UL damp rated" or "UL rated for wet locations." If the product description says simply "UL Listed" or "ETL Listed," it is only safe for dry locations and indoor use. If the product description says "indoor / outdoor" it may have a damp rating, and if it's described as outdoor it may have a wet rating. But don't assume. Especially when safety is at stake. before you make your purchase to be sure it will work safely where you need it. Portable swamp coolers that can be used safely outdoors always include a three-pronged ground or "earth" prong as well as a GFCI plug. These are critical features for any outdoor installation. They ensure that if there is any surge of electricity the appliance will shut off automatically before any major damage can be caused to person or property. Always perform the basic safety test on your GFCI plug before using it outdoors. Look for shut-off switches for motors and pumps. These switches automatically shut off specific parts of the swamp cooler when there is a condition that could cause overheating of that part. Too much water around the motor could cause it to shut off. Not enough around the pump could cause it to shut off. Much of what makes a swamp cooler, or any electrical appliance, safe to use outdoors is how it is installed and used. You can buy the best-made wet-rated swamp cooler, but if you set it up carelessly it might be unsafe. Read our page on electrical safety outdoors for tips on safely installing and setting up all kinds of outdoor cooling devices. Installation involves connecting your swamp cooler to an electricity and water source, and providing a drain for the waste water. This can be tricky if you're setting it up for outdoor cooling. It's often hard to find all of these resources in the location where you want to use your cooler. Because of this they are especially helpful at cooling partly enclosed areas near the outside of buildings that have these resources. But using a generator for a power supply and adding a portable water tank can make them useful almost anywhere. Partially enclosed areas can also increase the cooling effect by somewhat containing the cool air. But keep in mind that if the area is totally closed, moisture from the unit will accumulate and the area could get "swampy." Make sure the area you are cooling has plenty of fresh air available -- at least 2 square feet for every 100 square feet or 0.186 square meters for every 9.3 square meters you want to cool. You may need to open a window or door of a shed or trailer, or pull back the flap of a tent. Have your swamp cooler in position and level before connecting it to water and electricity. You'll need to connect the water supply or fill the water tank before you connect the electricity. This gives you a chance to make sure any water connections are leak-proof and any spills are dried up before connecting the electricity. Make sure all of your connections to electricity are waterproof and use grounding / earth plugs with GFCI protection. Unless your swamp cooler has a pre-cool setting the unit will need to run for a few minutes before you feel any cooling. These minutes allow time for the pads to become filled with water that creates the cooling evaporation. When you turn off the unit, you'll need to run the fan for up to 15 minutes with the pump off. This allows the pads to dry out. This prevents mold and bacteria build-up.